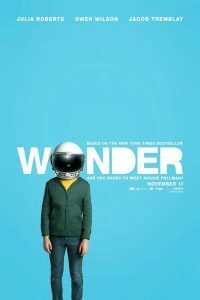 Based on a best-selling young adult novel by R. J. Palacio, Wonder tells the story of a boy named Auggie (Jacob Tremblay) with disfigured facial features. His loving parents Isabel (Julia Roberts) and Nate (Owen Wilson) have home schooled Auggie through the fourth grade to protect him from the stares and taunts of other children, and adults too. Auggie often wears a helmet with a plastic shield over the face to keep people from seeing his face. As the movie opens, it’s the beginning of the school year, and Nate and Isabel decide it’s time to send Auggie to a regular school. A kind principal, Mr. Tushman (Mandy Patinkin) greets Auggie and Isabel and arranges for three students to show him around the school the day before classes begin. The next day, Auggie, Nate, and Isabel, full of nerves and apprehensions, arrive for the first day of school. Even though Auggie is the main character in Wonder, I like the choice of the writer/director Stephen Chbosky not to make the movie only about him. There are other people in the world, adults and children, who interact with Auggie. Like most of us, they act with kindness some days, and other days they’re not their best selves. And each of them has a story. The others include Auggie’s older sister Via (short for Olivia), who is a great older sister. Yet, understandably, Via can resent the attention her parents (especially Isabel) pay to her younger brother. Via’s best friend Miranda comes back from summer vacation and seemingly without reason, barely speaks to Via. A boy named Jack befriends Auggie, but one day Auggie overhears Jack say mean things about him. I liked the attention the movie paid to these secondary characters and give reasons for their lapses in good behavior. It would have been very easy to portray them as one-dimensional, while keeping the focus totally on Auggie. Wonder retains its young adult appeal, while still being appealing to adults. Auggie is badly treated by many of his classmates and cries at home. His parents wonder if they’ve done the right thing. Eventually he makes friends, and experiences bullies. Teachers are sympathetic. When Mr. Tushman meets with the parents of a bully, we see where the bully gets his bad behavior. Wonder could easily have been a predictable and overly sweet movie. But surprisingly, it’s become one of the few non-sequel movies of the year without a huge budget and superhero characters to actually find its audience and become a hit with both young people and adults. (Certainly the star power of Julia Roberts didn’t hurt!) Wonder is authentic with a sense of humor. It’s full of scenes that stuck with me. In one of my favorite scenes, Nate and Isabel take Daisy, their beloved family dog, to be put to sleep. In the next scene, Nate is in the basement crying. There wasn’t a dry eye in the house after that! Chbosky has assembled a great cast. Julia Roberts is warm and loving as Isabel; Owen Wilson is the “cool” dad who can connect in a special way with his children. Young Jason Tremblay is great as Auggie. Wonder is a hopeful film. Even though life is hard, and we all make mistakes, there are good and kind and caring people to help us get through. The really special people like Auggie bring out the best in us all.